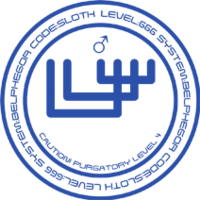 Digimoji (デジ文字 Dejimoji, lit. 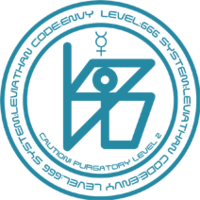 "DigiLetters") are a collection of logographic symbols used in the Digital World that represent both the list of kana and the English alphabet. 3.1.6.1 Ultimate Power! Activate Burst Mode!! 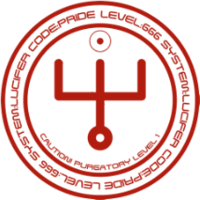 Thus, on Goatmon they would read "Wh- / -ght and shadow are joined, / us in the eyes / that faces /"
In episode 49, at the Numemon-enslaving factory led by Waru Monzaemon, there is a Digimoji inscription seen on each of the two domes which reads " ". 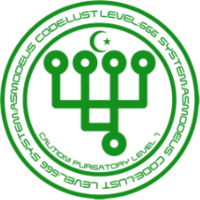 This translates to "Clean Energy" (クリーンエネルギー). Digimoji can be seen on the Digital Analyzer. 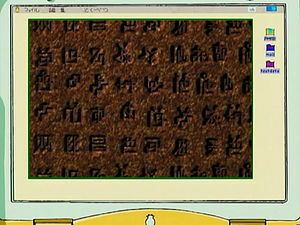 It can also be seen on the Holy Stones, reading "Digital Monster". In episode 12, Sora asks Starmon whether or not he has seen Piyomon and in response to her description, Starmon brings up multiple wanted signs written in Digimoji. 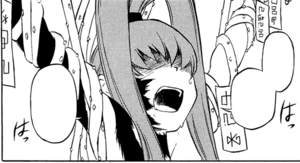 This translates to "Ph'nglui mglw'nafh Cthulhu R'lyeh wgah'nagl fhtagn" (フングルイ ムグルウナフ クトゥルウ ルルイエ ウガフナグル フタグン), an occult phrase from H. P. Lovecraft's The Call of Cthulhu which means "In his house at R'lyeh, dead Cthulhu waits dreaming". Later, when Hikari is alone, she walks past a sign that reads - "Innsmouth" (インスマウス), a fictional town in Cthulhu Mythos. Later, in episode 36, the children discover a spring that naturally gives forth soup, but fail to read the sign warning them not to drink it. The Digimoji translates to "中華スープの泉: 聖なる中華な泉のスープを無断で呑むことを禁ず無断で呑んだ者は罰する", so in English the sign would be read as "The Chinese Soup Spring: It is forbidden to drink the soup of the sacred Chinese Spring without permission and those who drink it without permission will be punished." 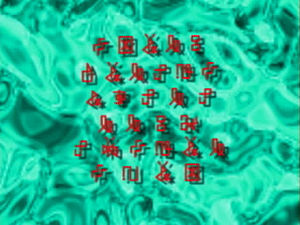 When the Tamers use their D-Arks to evolve their Digimon to the Adult level, Digimoji are displayed which reads: — "Evolution" (エボリューション Eboryūshion), but this is written in fragments - followed by shown vertically to the left of the screen, hence they would translate as "Evoluti—" and "—tion" respectively. 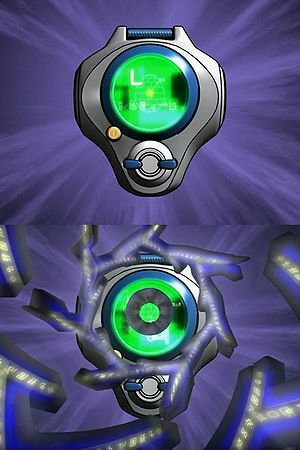 Also, during that moment, they are surrounded by a "cocoon" of Digimoji which repeatedly displays a random sequence of letters ( ), reminiscent of movies with a cyberspace theme, in which random characters appear everywhere as well as flowing with the digital theme of Digimon Tamers. In episode 35, Takato's D-Ark is destroyed as a result of Guilmon becoming Megidramon and he receives a new gold and white D-Ark in its place. This displays Digimoji on the golden outer rim of the screen which reads: — "Digimon Tamers" (デジモンテイマーズ Dejimon Teimāzu). Digimoji is the official language of the Digital World. It can be seen during Evolution sequences, Digital Dives and is also displayed on both DATS's computer screens and Thoma's handheld laptop. Top 2 rows: — "GAOMON GAOGAMON MACHGAOGAMON MIRAGEGAOGAMON"
Top 2 rows: — "LALAMON SUNFLOWMON LILAMON ROSEMON"
Top 2 rows: — "AGUMON GEOGREYMON RIZEGREYMON SHINEGREYMON"
Bottom 2 rows for all three: — "ROOKIE CHAMPION ULTIMATE MEGA"
When Masaru and the others revisit Wanderer's Cape, they came across a mysterious building that had a sign with Digimoji on it, reading — "Digisoul Dojo" (デジソウル道場, Dejisouru Dōjō). 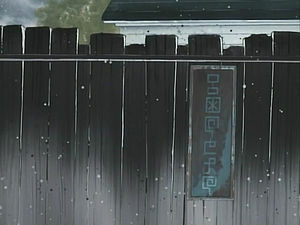 Similar signs reading "Digisoul" can be seen inside the dojo. — "Do not open" 「開けるな Akeru na」. There were also Digimoji on the wall outside this chest, but it was merely a table of the entire Digimon alphabet, arranged in Japanese yokogaki. 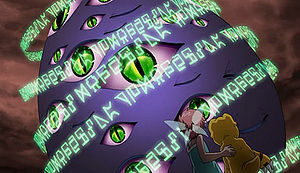 When Yggdrasill went berserk and began calling itself the "WIZ9000 Computer", random sequences of Digimoji appeared on its facial display. In "Agumon! Gaomon! Lalamon! Explosion! The Off-screen Last Battle! ", Gaomon states that both he and Thoma are fluent in Digimoji, which is one of the 170-plus languages that they have mastered. When watching clips of their previous battles, Gaomon reads the Digimoji on the Digisoul Dojo sign. Agumon is shocked that Gaomon understands it, and the latter is surprised by the former's illiteracy despite being a Digimon. When Dark Knightmon constrains Nene using a Blossomon and tortures her in attempt to separate her from Shademon, several ofuda are attached and have Digimoji displayed on them. 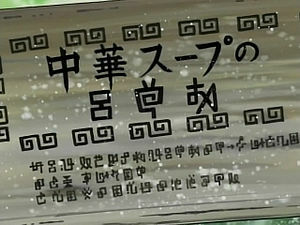 The first two ofuda that appear read (アトリエ Atorie) and (ほしいよ Hoshii yo), which together translate as "I want Atelier!". 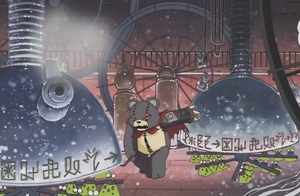 The reference to the Atelier series is most likely due to the fact that Kosugi Jyurohta, Dark Knightmon's voice actor in the anime, has provided his voice to several titles, most notably as Sterkenburg Cranach, who is a supporting character in Atelier Rorona: The Alchemist of Arland, Atelier Totori: The Alchemist of Arland 2 and Atelier Meruru: The Alchemist of Arland 3. The Digimoji written on the other ofuda (displayed below) also reflect this, as these translate as the names of the main protagonists of the aforementioned games in addition to other female characters that appear in those games. Finally, four different words appear during the end of the torture. The Digimoji for these read (アイス Aisu), (食べたい Tabetai), (お腹 Onaka) and (減った Hetta), which translate collectively as "I want to eat some ice cream, I'm hungry". Wizarmon casts a spell using Digimoji that disguises the Xros Heart members as humans and animals. The spell reads (デジ文字は大抵アシスタントさんに適当な事を書いて貰っています Dejimoji ha taitei Ashisutanto-san ni tekitouna-koto wo kaite moratte imasu), translating as "Digimoji were something mostly appropriate written down for me by Ms. Assistant."  In order to counterattack Shoutmon X7, Lilithmon casts a magic circle. 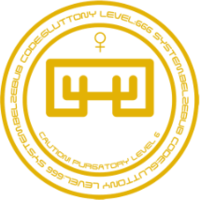 Part of the inner circle has Digimoji reading (エロイムエッサイム、我は求め訴えたり Eroimu Essaimu, ware ha motome uttaetari; lit. "Eloim, Essaim", I seek and beseech thee"), which itself is a translation of the black magic incantation "Eloim, Essaim, frugativi et appellavi", found in the grimoire La Poule Noire and popularized in Japan by the manga series Akuma-kun. 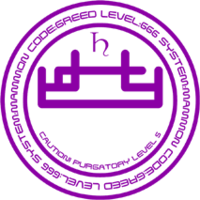 The seal containing Lucemon displays N, S, E, and W ( , , and respectively) at the cardinal points, "DARKNESS" ( ) clockwise along the outer circle, "SEAL" ( ) to the left, right, top, and bottom of the "octagon" formed within the central circle, and a Digital Hazard symbol in the middle, depicted similar to the diagram (right). 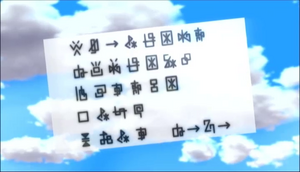 Each time when Kagura uses the Seven Great Demon Lords' Code Keys to unlock the seal, Digimoji newly appear in vertical segments highlighted in red, but these are just random letters (ex: "r", "t", "h", "e", "l"). It also appears during evolution, however this is merely random sequencing of letters, for example "dfslkfghh" ( ). Lalamon's Special Move "Sing-a-Song" displays characters which include "sa", "ya", "su", "gi", "ra", "ri", "go", "ku", and "mu".
" " has been inscribed." "Fragments of Memory" has been inscribed." "Find me as soon as possible." " , - - -"
"Who are you? Who am I? Who? Who? For you? For me? For whom? Who? Who? Who?" "Error, foreign objects must be eliminated immediately." ↑ "Agumon! Gaomon! Lalamon! Explosion! The Off-screen Last Battle!" ↑ Digimon Xros Wars: "Xros World!! The Secret of the Two Worlds!?" ↑ Digimon Xros Wars: "Xros Shape!! Enjoy the Human World!!?" ↑ Digimon Xros Wars: "Xros Wars!! The Prologue to the End!!" ↑ 1.0 1.1 1.2 The various letters are scattered about the cape in no particular order. 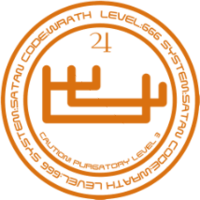 ↑ 2.0 2.1 St-129 depicts the gate as reading "Digital Monster", as opposed to "Heaven's Gate". ↑ Various illustrations alternate between one of these being used throughout, or one being used for the shoulders and one for the knees. ↑ Digimon World Re:Digitize depicts the blade as reading "Khaos", as opposed to "Khaosmon". ↑ The Digimoji on Omegamon X-Antibody's sword is depicted from hilt to tip, the reverse of Omegamon.